I saw this while shopping last week. 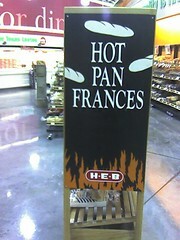 French bread is a good thing, but this sign just is nuts. It starts in English, with "hot", but then uses the Spanish term for "French bread", leaving off the acute accent on the 'e' in 'francés'. But, it's French bread, so why not write "Pain français"? Not as much... it's the HEB at Parmer and IH-35. Oh man, that's asking for a "crack panda" 'i' sticker between the "A" and "N"! Well, because we don't hold with that French nonsense. But we want to be highfalutin' and convey that this bread is special - indeed, it's foreign. But not *that* foreign. Spanish is only a little bit foreign, right? At least they didn't call it freedom bread. Oh la la! C'est pain de liberté!